Main (public) entrance on The Mall, London, England is shown above. Offices and postal address are situated at 12 Carlton House Terrace. The Institute of Contemporary Arts (ICA) is an artistic and cultural centre on The Mall in London, just off Trafalgar Square. It is located within Nash House, part of Carlton House Terrace, near the Duke of York Steps and Admiralty Arch. It contains galleries, a theatre, two cinemas, a bookshop and a bar. Since 2011, the director has been Gregor Muir. The ICA was founded by primitivism. 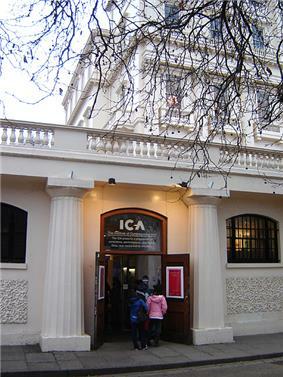 In the late 1940s, the ICA met in the basement of the Academy Cinema, 165 Oxford Street. The Academy Cinema building included the Pavilion, a restaurant, and the Marquee ballroom in the basement; the building was owned by George Hoellering, the film, jazz and big band promoter. Ewan Phillips left in 1951, and Dorothy Morland was asked to take over temporarily, but stayed there as director for eighteen years, until the move to the more spacious Nash House. The critic This Is Tomorrow. 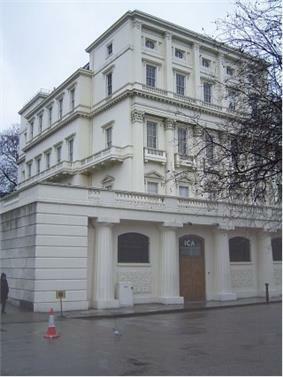 With the support of the Arts Council, the ICA moved to its current site at Nash House in 1968. For a period during the 1970s the Institute was known for its often anarchic programme and administration. Norman Rosenthal was director of exhibitions at this time, and he was once assaulted by a group of people who were living in the upper floors of the building at the time. A bloodstain on the wall of the administrative offices is preserved under glass, with a note reading "this is Normans's blood". Rosenthal claims the group which assaulted him included the actor Keith Allen. Kate Bush, Deputy Director of Exhibitions, 1994–97. Mik Flood took over as director of the ICA in 1990 after McAllister's resignation. Flood announced that the Institute would have to leave its Mall location and move to a larger site, a plan which ultimately came to nothing. He also oversaw a sponsorship scheme whereby the electrical goods company Toshiba paid to have their logo included on every piece of ICA publicity for three years, and in effect changed the name of the ICA to ICA/Toshiba. He was replaced as Director in 1997 by Philip Dodd. In 2002, the then ICA Chairman Ivan Massow criticised what he described as "concept art", leading to his resignation. The ICA appointed Ekow Eshun Artistic Director in 2005 following the departure of Philip Dodd. Under Eshun's directorship the Live Arts Department was closed down in 2008, the charge for admission for non-members was abandoned (resulting a reduction of membership numbers and a cash shortfall), the Talks Department lost all its personnel, and many commentators argued that the Institute suffered from a lack of direction. A large financial deficit led to redundancies and resignations of key staff. Art critic JJ Charlesworth saw Eshun’s directorship as a direct cause of the ICA’s ills. He criticized his reliance on private sponsorship, his cultivation of a "cool" ICA brand, and his focus on a cross-disciplinary approach that was put in place "at the cost," Charlesworth wrote, "of a loss of curatorial expertise." Problems between staff and Eshun, sometimes supported by the Chairman of the ICA Board, Alan Yentob, led to fractious and difficult staff relations. Eshun resigned in August 2010, and Yentob announced he would leave. The ICA appointed Mark Sladen as Director of Exhibitions in 2007 to replace Jens Hoffmann who was appointed Director of the Wattis Institute for Contemporary Arts in 2006. Sladen left the post in 2010. Alison Myners replaced Alan Yentob as Chair of the ICA Council in October 2010. The ICA appointed Gregor Muir as its new Executive Director in January 2011, taking up his post on 7 February 2011. 1950: London-Paris. New Trends in Painting and Sculpture - launching the Geometry of Fear sculptors. 1952 Sixteen Young Sculptors organised by David Sylvester. 1952: Formation of the "Young Group," consisting of artists Nigel Henderson, Toni de Benzio, Reyner Banham and Richard Lannoy, facilitated by the ICA Assistant Director Dorothy Morland. 1953: Alfred Barr, Director of New York's Museum of Modern Art (MoMA) delivers a lecture entitled "They hate Modern Art or Patterns of Philistine Power". 1957: Paintings by Chimpanzees, curated by then ICA Director Desmond Morris. 1966-68: Yoko Ono contributes to Destruction in Art Symposium orchestrated by Gustav Metzger. 1976: Mary Kelly exhibits the first part of Post-Partum Document, an exploration of the mother-child relationship developed between 1973 and 1979. Each section highlights a formative moment in her son’s mastery of language, along with the artist's sense of loss. Informed by feminism and psychoanalysis, the work alternately adopts the voice of the mother, the child, and an analytic observer. The installation provoked tabloid outrage at the ICA because of stained (but laundered) nappy liners incorporated in Documentation I. 1976: A retrospective of COUM Transmissions (Genesis P-Orridge and Cosey Fanni Tutti who subsequently formed Throbbing Gristle) entitled Prostitution features sanitary towels and explicit photographs. The exhibition is held concurrently with Mary Kelly's Post-Partum Document. 1980: Concert by This Heat released as a CD in 2007. 1980: Sees several important feminist art exhibitions: 4–26 October, "Women's Images of Men" (curated by Joyce Agee, Jacqueline Morreau, Catherine Elwes, Pat Whiteread); 30 October–9 November: 'About Time: Video, Performance and Installation by 21 Women Artists' (curated by Catherine Elwes, Rose Garrard, Sandy Nairne); 14 November–21 December: "Issue: Social Strategies by Women Artists" (curated by Lucy R. Lippard). 1986: Helen Chadwick’s stinking pile of rotting vegetables, Carcass, is removed after complaints from neighbours and a visit by health inspectors. 1989: Gerhard Richter shows black and white oil paintings of the Baader-Meinhof gang inspired by contemporary newspaper and police photographs. 1990: Vaclav Havel launches Censored Theatre, a programme of readings of suppressed plays. The first reading of Death and the Maiden by the young Chilean playwright Ariel Dorfman, is performed by actors including Juliet Stevenson. Harold Pinter, in the audience, said the play "felt like it was a sequel to his own 1984 play One for the Road, which also revolved around a woman who had been raped and tortured". 1991: Damien Hirst’s exhibition International Affairs, his first solo exhibition in a public gallery, features glass cases containing items such as a desk, cigarette packets and an ashtray. 1994: A video camera is set up in the men’s toilets, and real-time images of urinating visitors are relayed to a screen in the theatre in a piece by Rosa Sanchez. 1995: Bear and Five Easy Pieces, films by future Turner Prize-winning artist Black Audio Film Collective, Renée Green, Lyle Ashton Harris, Isaac Julien, Marc Latamie, and Glenn Ligon. An accompanying symposium, Working with Fanon, debates the legacy of Frantz Fanon within the context of art and visual representation. Speakers include Homi K Bhabha, Paul Gilroy, Stuart Hall, bell hooks, Isaac Julien, Kobena Mercer, Raoul Peck, Ntozake Shange, Françoise Versages, and Lola Young. 2000-05: The annual Beck’s Futures prize is set up to celebrate the work of emerging artists. 2008: Over a six-month period, and as part of the ICA's 60th birthday year, the exhibition Nought to Sixty presents 60 emerging artists based in Britain and Ireland. 2011: The ICA hosts Bruderskriegsoundsystem, the latest project from Edwin Burdis, Mark Leckey, Kieron Livingston and Steven Claydon. Pablo Bronstein's exhibition Sketches for Regency Living takes over all of the ICA building for the first time in its history. 2012: The Remote Control exhibition took a historical look at television's influence on contemporary art. ^ Allen Eyles, "Cinemas & Cinemagoing: Art House & Repertory", BFI Screenonline. ^ Hattenstone, Simon (25 November 2002). "I'm a lucky bugger". The Guardian (London). ^ Jack, Adrian (28 June 1993). "Obituary:Sandy Broughton". The Independent (London). ^ Nowicka, Helen; Welch, Jilly (12 August 1994). "ICA to quit Mall for big river complex". The Independent (London). ^ Alberge, Dalya (10 March 2005). "ICA appoints the first black gallery director". The Times (London). ^ "Should we let the ICA die". The Times (London). 28 January 2010. ^ Milliard, Coline. "London ICA Director Ekow Eshun Submits His Resignation | BLOUIN ARTINFO". Artinfo.com. Retrieved 2014-04-18. ^ Higgins, Charlotte (23 January 2010). "ICA warns staff it could close by May". The Guardian (London). ^ Edemariam, Aida (27 August 2010). "Ekow Eshun and Alan Yentob to quit after ICA survives crisis". The Guardian (London). Retrieved 7 August 2015. ^ Edemariam, Aida (28 August 2010). "'"Ekow Eshun: 'It's been a tough year…. The Guardian (London). ^ "Art Review". Art Review. Retrieved 2014-04-18. ^ Brown, Mark (11 January 2011). "Gregor Muir to be new ICA chief". The Guardian (London). ^ Kelly, Mary. "Post-Partum Document". Mary Kelly. Retrieved 2 February 2014. ^ Nairne, Sandy (1908). Women's Images of Men. London: ICA. ^ Elwes, Catherine (1980). About Time: Video, Performance and Installation by 21 Women Artists. London: ICA. ^ Lippard, Lucy (1980). Issue: Social Strategies by Women Artists. London: ICA. ^ "Are Fetishistic Practices Politically Radical". British Library Sound Archive. Retrieved 1 February 2014. ^ Haye, Christian. "Just an Illusion". frieze. Retrieved 12 February 2014.